a strade semplici e dirette. Bassano is a beautiful city. It was first established by the Romans. The sight of the covered bridge, Ponte Vecchio (which was designed by the famous architect Andrea Palladio in 1569 and is the city’s trademark), is breathtaking. The city has a very long History, which has left many visible marks and signs that you can explore: its medieval towers and the walls surrounding the old city, the Castle, the many Churches and Museums. 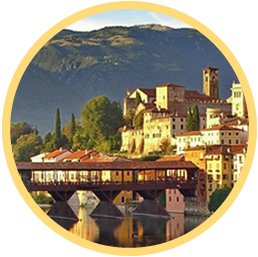 Bassano is known worldwide for its distilleries and it offers a good variety of shops. Just minutes away from Bassano there are routes that take you to some of the most beautiful Mountains in the World. Peaks, plateaus abundant with alpine huts and agritourisms offering their traditional products. Hiking paths starting from Bassano or from the villages near by. 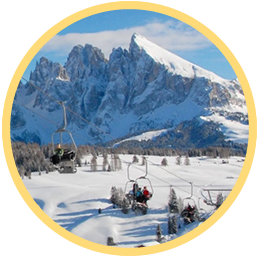 Ski resorts open during the winter season. The area has a long history of culinary art and wine. 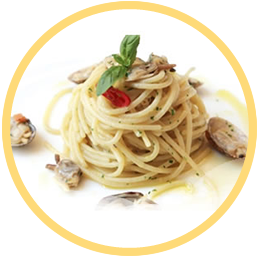 You can wine and dine in very fine restaurants as well as in family owned trattorias. You can go to the many local wineries and taste their selection of wines.